This is a solid offering for the money, and the bundled docking station is a neat touch to differentiate the Voyager III Pro. As years go by, it becomes difficult for laptop vendors to differentiate their offerings. After all, notebook components are manufactured by a slowly diminishing number of companies. The laptops themselves are built by just a handful of big original equipment manufacturers (OEMs) and outside of the big five laptop sellers, the designs of smaller brands are worryingly similar, especially when it comes to gaming and business laptops. But British vendor PC Specialist has come up with a plan: giving away a freebie, one which is actually useful for businesses that have embraced hot-desking and flexible working in droves. The Voyager III Pro (also known as the Clevo N350DW) is the company's flagship business model and retails for £775 (around $1,100, AU$1,490) including VAT and delivery. That includes a free professional docking station that boasts 16 ports and connectors: four USB 3.0 ports, a Kensington lock, a DVI connector, D-Sub/VGA, HDMI, an Ethernet port, serial, a power port, three audio ports and three USB 2.0 connectors. Sadly, there's no DisplayPort, Thunderbolt 3 or USB-C.
You can connect your laptop to this peripheral within seconds thanks to a convenient docking port. This accessory costs £89 (around $125, AU$170) but we've seen a number of rivals with far fewer connectivity options retail for nearly twice the price (with these competitors requiring you to plug in two cables rather than one, when connecting the thing up). One thing to note, however, is that the Voyager III Pro by itself is a bit chubby. At 2.4kg and measuring nearly 33mm thick, it is far too big to qualify as an Ultrabook and will pose a challenge for anyone used to thin and light devices likes the Dell XPS 13. The first thing that strikes you is the lack of branding. There's absolutely no indication on the chassis who the vendor is. That's not the only thing we liked about the Voyager III Pro. PC Specialist has opted for slightly convex or domed keys, bucking the trend that favours the opposite. The typing experience reminds me of the Dell XPS 13 – it's sharp and punchy with audible feedback. The keyboard is backlit (with five levels of brightness) and comes with a dedicated numeric keypad. The touchpad has two dedicated mouse keys which are a bit too hard for my liking. A fingerprint scanner is located between the two, and also note that the pad itself isn't clickable. Like the rest of the computer's exposed surfaces, it sports a rubbery finish, albeit much smoother than the palm rest or the cover. All in all, the Voyager III Pro might well be unexceptional aesthetically, but it does feel like a solidly built workstation. The screen is a 15.6-inch matte full HD effort which can be pivoted flat on a table surface. Colour reproduction is excellent out of the box with limited bleeding on the edges and some decent contrast. The bigger-than-average power key is located just below the screen; we counted a jaw-dropping seven status lights as well. Ports include HDMI, three USB 3.0, one USB 2.0 port, VGA, audio in/out, Gigabit Ethernet, a Kensington lock and even an SPDIF out connector. Inside the Voyager Pro III are some quality components including a few which might cause some confusion at first glance. PC Specialist engineers chose a Skylake-based Intel Core i5-6500T CPU – compared to the Core i7-6500U which is clocked at 2.5GHz, it costs half the price, has 50% more cache (6MB), twice the core count, can address up to 64GB of RAM, offers vPro, TSX-NI, Trusted Execution Technology and has a better graphics subsystem (HD Graphics 530 clocked at 350MHz). The only notable downsides are the TDP, which at 35W compares poorly with the 6500U's 15W; there's also the absence of hyper-threading. Sadly, PC Specialist doesn't provide you with a discrete graphics card option. Neither of these points should affect performance though and in theory, the 6500T, despite its Core i5 moniker, should easily outclass its Core i7 cousin especially with multicore tasks. Clearly someone did his (or her) homework at PC Specialist. Our sample PC came with a 240GB Kingston SSDNow M2.2280 solid state drive (with a rated read/write speed of 550MBps and 330MBps respectively) and a 1TB hard disk drive courtesy of Toshiba. Note that you can add another hard disk drive and even swap both of them for a pair of 2.5-inch SSDs (which you can use in RAID-0 mode for more oomph). The maximum storage capacity of the laptop is a whopping 4.5TB. There's also a single 8GB Kingston SODIMM DDR3 memory stick (which we urge you to double to 16GB for £27). Doing so makes full use of the CPU's support for dual-channel which improves overall performance. 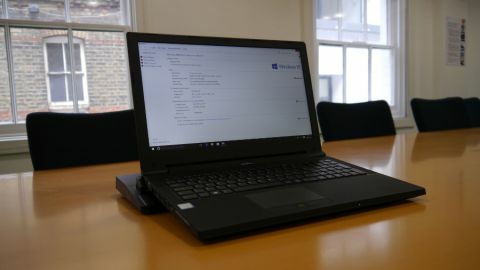 The rest of the configuration includes a pair of 2W speakers located underneath the palm rest, a 1-megapixel camera – supporting Windows Hello – a DVD writer, a card reader, 802.11ac wireless and Windows 10 Professional. We were puzzled by the presence of an ExpressCard slot which seems a highly anachronistic inclusion for a 2016 laptop (although we suppose you could use it to add an RS232 adaptor). PC Specialist – uniquely amongst its peers – is the only one to offer a one month collect-and-return, one-year parts and three-year labour warranty. A one month collect-and-return is frankly a laughable option and we'd advise opting for the silver warranty which costs an extra £5 and ups the collect-and-return warranty to one year. We didn't test the battery life but PC Specialist says that the 62Whr 6-cell battery will power the laptop for up to five hours. The idea of giving away a useful freebie, a docking station worth £89 (around $125, AU$170), is an excellent one. We applaud PC Specialist for that and encourage other vendors to follow suit. However, that said, doing this has a number of disadvantages. It increases the price of the package (although you can actually unselect the dock from the configuration menu), it requires a complex mechanism within the host laptop (making it far thicker and heavier as well) and lastly, for the vendor, a docking station might generate a truckload of potential issues related to power management and general compatibility. There's not much that PC Specialist could have done about any of that, though. We actually prefer a more modern take on the docking station like the Lenovo ThinkPad One Link Pro or the Dell Thunderbolt Dock where no docking actually occurs. Instead, you connect a single cable to your laptop and that's it. The Holy Grail is obviously to eliminate cabling and embrace wireless connectivity for charging and data transfer. Technologies like WiGig and WPC could make that a reality by the end of the decade with these features built-in to your desk or furniture, allowing you for example to log in directly by sitting at your desk, without any need for passwords. If there was one improvement that should definitely be made, it would be to upgrade the ludicrous collect-and-return warranty. At £5, it should be included in all offerings by default in our opinion. As for alternatives, the Lenovo ThinkPad E560, the Dell Inspiron 15 5000 and the HP EliteBook 1040 G3 are within a similar price bracket but with different feature sets.